Dr. Faith Mwangi-Powell, MSc, Ph.D. serves as the Global Director for The Girl Generation providing strategic direction, business development and technical oversight for our activities globally. 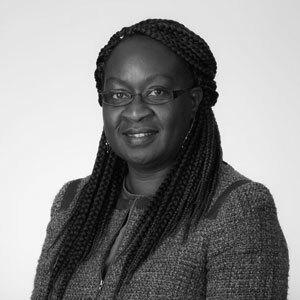 Mwangi-Powell is a public health expert and senior manager of complex public health programs in Africa with more than 18 years of experience in leading, managing, implementing, health programs. Her experience includes working as the founding Executive Director of the African Palliative Care Association and supporting palliative care global advocacy and services development in over 20 African countries. Mwangi-Powell has also worked as the University Research Company’s Chief of Party for the USAID ASSIST Project, where she provided technical leadership and managerial oversight for the design and implementation of project strategy in HIV Care and Treatment, MNCH, OVC and malaria. She has also worked in palliative care global advocacy and financing with the Public Health Program of the Open Society Foundations, based in New York and provided strategic leadership around palliative care advocacy, accountability and resource leveraging. Mwangi-Powell is a passionate and results-orientated leader coming from a community health background and with an established background and specialist knowledge in palliative care, HIV/AIDS including OVC and child protection, advocacy, sexual reproductive health, human rights, gender, and TB. She has extensive expertise in organizational development and has provided OD assistance various organizations at national, regional and international levels, as well liaising with governments and donors to establish national policies, procedures, and systems. Academically, Faith holds a master’s degree in Population Policies and Programs from Cardiff University, Wales, and a Doctorate in ‘Women’s economic development and fertility behavior’ from the University of Exeter, England. She has published in internationally renowned peer-reviewed scientific journals with a major focus on sexual and reproductive health, community health, and palliative care, primarily in resource-limited setting.